This was my first experience cooking tempeh. I randomly bought it a few months ago, stashed it in my freezer, and forgot about it. Earlier this week I “discovered” it and remembered that I better use it before it got freezer burned or something. I set out to find a great recipe, but couldn’t find anything that really sparked my interest. Finally, I gave up and just made something up. It worked out pretty well except that I might add some chopped cashews next time. I would probably also go for lettuce with a bigger leaf than romaine, or at least bigger than the puny heads of romaine that I bought. This one will definitely make another appearance at Duke’s House, maybe with shredded chicken next time. Chris did not get to taste it, but I am quite confident that he would give it the “we can serve this to other people” seal of approval! Spray a skillet with olive oil spray. Cook the tempeh at a medium-high heat for about 5 minutes on each side until lightly browned. Add mushrooms, water chestnuts, garlic, and scallions and cook for several more minutes. If needed, add a tablespoon of water to the skillet. Next add the hoisin sauce, soy sauce, and cilantro and continue to cook until vegetables are tender. 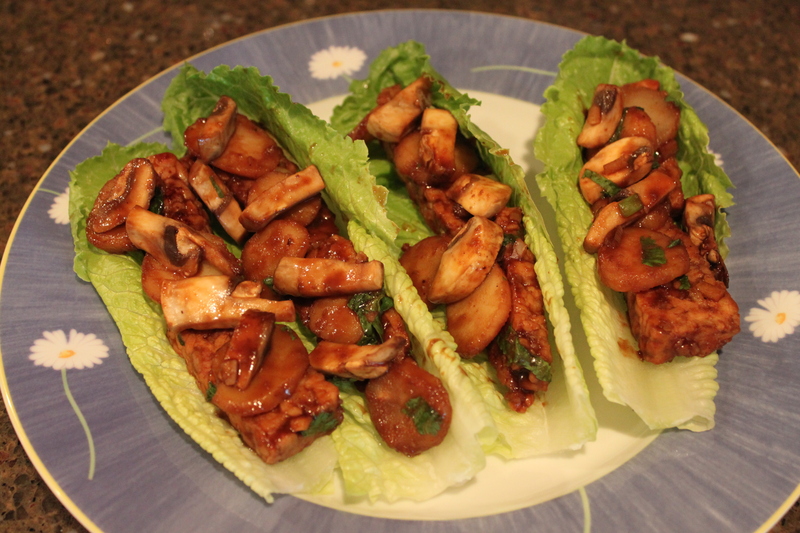 Serve with large lettuce leaves, either pre-wrapped or as an “assemble your own dinner” a la fajita.